EMS vehicles are significantly more complicated than comparable vans and trucks because of the extensive array of medical equipment and cooling systems installed in these emergency service vehicles. Working with a reputable emergency medical service vehicle dealer like Frazer ensures that your EMS vehicles are up to the challenge of providing reliable service and are mechanically sound. 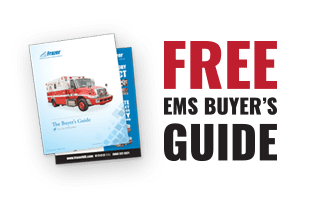 There are a few important factors to consider when buying emergency medical service vehicles or working with a used ambulance dealer on behalf of your organization or facility. Type I models separate the driver’s cab from the medic unit and do not allow personnel to pass easily between the two sections of the vehicle. These emergency service vehicles are built on the chassis of a truck with LiquidSpring suspensions. 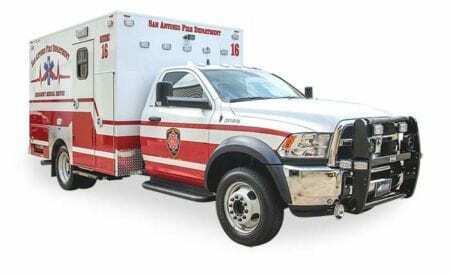 Type III models are similar to Type I custom EMS vehicles but are built on a van chassis..
First Responder or UCV vehicles are highly configurable with abundant storage and tons of layout possibilities. First Responder vehicles are also designed to bring even more equipment and personnel to a scene. Mobile Stroke Units are built with LiquidSpring suspension systems and automatic leveling systems enabling consistent operations on uneven roads. Remountable. Mobile Health Clinics are built on a platform with massive configurability. These can function as clinics, immunization vehicles, evaluation vehicles blood draw and more. Whether you need a used ambulance for use as a mobile health clinic or an emergency response vehicle, refurbished EMS vehicles can provide real cost savings while ensuring the most practical solutions for agencies responsible for supplying these medical response services. By looking for pre-owned ambulances that have been upgraded and renovated, you can often acquire a good working vehicle at a fraction of the cost of new EMS vehicles. The reliability and durability of Frazer’s inventory of used ambulances can help you make the most cost-effective and practical choice for your municipality, agency or other organization. Identifying any common mechanical issues or chassis concerns is taken care of by Frazer before the units are ever posted on site. At Frazer, we offer new emergency medical service vehicles (EMS) and used ambulances for a wide range of applications. If you need a remount for your renovated vehicle, we can provide you with the options necessary to serve patients throughout your area in the most practical and cost-effective way. To learn more about our entire range of emergency medical service vehicles, mobile healthcare vehicles, mobile stroke units and used ambulances, give us a call today at 1-888-372-9371. Our sales staff and remount technicians are here to serve you.